A resident or seasonal explorer of the Adirondacks, you may believe that our cool, northern landscapes are devoid of venomous animals. Sure, rattlesnakes inhabit a smattering of sun-warmed spots along the shores of Lake George and Lake Champlain, but that’s all, isn’t it? You might fall off a cliff here, or die of hypothermia, or be eaten by a bear, the bear being chiefly theoretical because no one we know of has been eaten by one in the Park to date. But you can rest assured that no venomous creature will do you harm. That’s a pleasant fantasy, yet it’s far from true. A fascinating new book by a pair of venom specialists, one in London, England, the other in Queensland, Australia, shows otherwise. The title is Venom: The Secrets of Nature’s Deadliest Weapon. The publisher in the United States is Smithsonian. Open the book if you dare. Be forewarned that the facts in Venom, once taken out, can never be put back in. This book is a Pandora’s box of unsettling information. For example, you may be unnerved to learn that venomous mammals run rampant in the places you go hiking and in campsites where you sleep on the ground. The male platypus is venomous, but of course it lives only in Australia. In the Adirondacks, the venomous mammals you have to be concerned about, the ones that can deliver potent neurotoxins with a single bite, are moles and shrews. Until I picked up this book, I knew that the short-tailed shrew, abundant hereabouts, contains venom in its saliva akin to the notoriously lethal venom of cobras. I did not know that all shrews are believed to be venomous. In our backyard, we’ve recorded three species: the northern short-tailed, the cinereus, and the smoky. According to our friend Larry Master, a small-mammal expert, we very likely have American water shrews on our property, too (it abuts the Saranac River). The authors, Ronald Jenner and Eivind Undheim, explain that shrews use their venom, carried in saliva, like we use refrigerators. These tiny animals have prodigious appetites. When a shrew catches more than it cares to eat at one go, it caches the leftovers. Lacking a fridge, and not wanting its food to spoil, the shrew delivers venom with its bites. Neurotoxins paralyze the prey. As a result, the worm, insect, or small mammal that the shrew has envenomated stays alive and fresh until the shrew comes back to eat it. 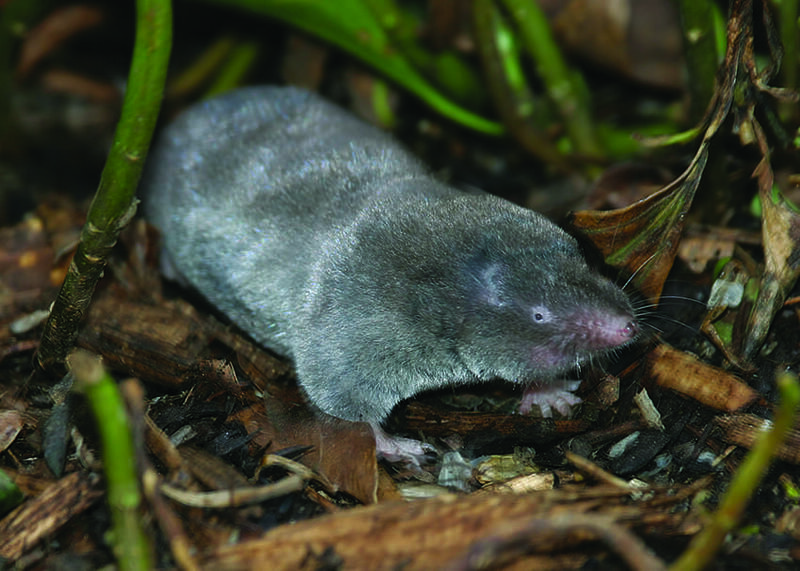 Moles, according to authors Ronald Jenner and Eivind Undheim, are venomous, too. On our property we’ve recorded only one of those, the hairy-tailed, but we may also have the star-nosed mole. Five or six species is a pretty good collection of venomous mammals. The burning question about them is this: are they dangerous to humans and pets? The standard answer, and the one suggested in this book, is that they are not dangerous. Circumstantial evidence supports the thesis. Virtually all of us live in the presence of venomous shrews and moles whether we know it or not. But how many of us have suffered consequences? And has anyone lost a dog to a shrew? My son, Ned, was nipped by a short-tailed shrew once. I was keeping it in brief captivity. The bite didn’t break his skin, and Ned had no reaction to it. But I know of one person who did regret a shrew bite. My late friend Kaye Anderson, a mentor to me in my early years as a naturalist, once handled a short-tailed shrew. Not only did it give her a nasty chomp on the forearm, but the entire arm swelled double, and it throbbed. Kaye’s doctor can be forgiven for having no idea how to treat a shrew envenomation. He could do no more than keep an eye on her. Happily, Kaye’s arm came right in about a week. Bees, wasps, and hornets are venomous, too. So, to varying degrees, are ants and spiders. As a guide, I’m often asked about the risk of animal attack in the Adirondack woods. My stock reply is that the animal most likely to do someone harm out there is not an irate black bear or a feisty moose but a yellow jacket. Injections of its venom account for dozens of deaths nationwide each year. Bushwhackers are especially vulnerable to attacks by these wasps. The danger is highest in late summer, when the populations in and around each nest may number in the thousands. 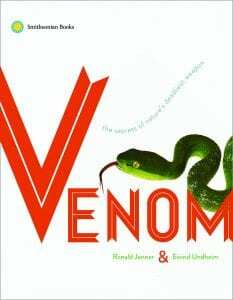 Venom: The Secrets of Nature’s Deadliest Weapon offers fascination on every page. Read it, but don’t stay indoors too long. When all is said and done, venomous creatures dangerous to humans really are rare in the Adirondacks—bees and their relatives excepted. Take sensible precautions, avoid stepping on yellow-jacket nests, and the subject of this book will likely be the least of your worries.